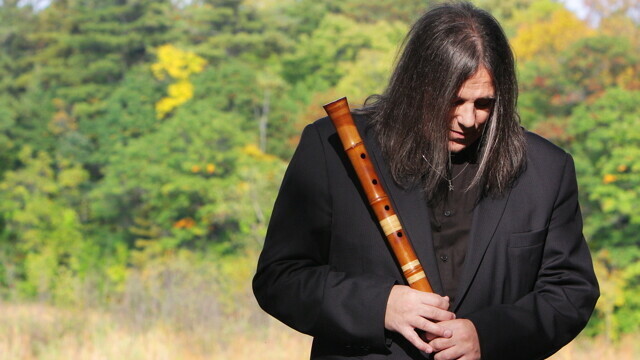 Local music veteran, world flute master, and Grammy nominee Peter Phippen continues to garner accolades for his many projects. Most recent: a Nammy nomination. Ask Peter Phippen about playing the flute and he’d likely respond, “It plays me. There are good days and there are bad days, but I play the mood it will allow me; there are no givens.” Peter’s relationship to his music is as deep as it gets. He describes it as a living thing. From the flute itself to the sound it makes, they have a soul that can only be attained through the moment. And right now, Peter is having quite the moment. Already recognized as an international sensation, he earlier this year enjoyed the increased visibility of a Grammy nomination, his third Nammy nomination (Native American Music Awards), and now he’s released a brand new album, Lavender Calm. The record is a collaborative release with Arja Kastinen, which combines the living sounds of Peter’s flute enriched with the beauty of Arja’s kantele, a stringed instrument of the Karelian and Finnish peoples. In the same way that Peter has immersed himself in the world of flutes and their rich history, Arja has done so with the kantele, learning its intimate secrets and compiling an extensive collection of them along the way. “We share a unique interest for our instruments,” shares Peter. Peter confesses that he has not always been the flutist he is today. His musical roots start 1,106 miles east in New York, where he grew up. His instrument of choice was bass, which he played in a band comprised of friends from school. In fact, Peter and the flute met accidentally in a furniture store (World Bizarre) in 1987 while couch shopping with his wife, Julie. Well, you can add Grammy nominee to local Native American flute god Peter Phippen’s already hefty resume. The 53rd Grammy Awards have nominated Phippen in their Best Native American Music Album (vocal or instrumental) category.